Hands on! About 3 pounds of shrimp, cooked with "crab boil," a flavor mix with mustard seed, coriander seed, cayenne, bay leaves, dill seed and allspice. With cocktail sauce with horseradish and tartar sauce in squeeze bottles, the shrimp were appetizers for about 10 people. 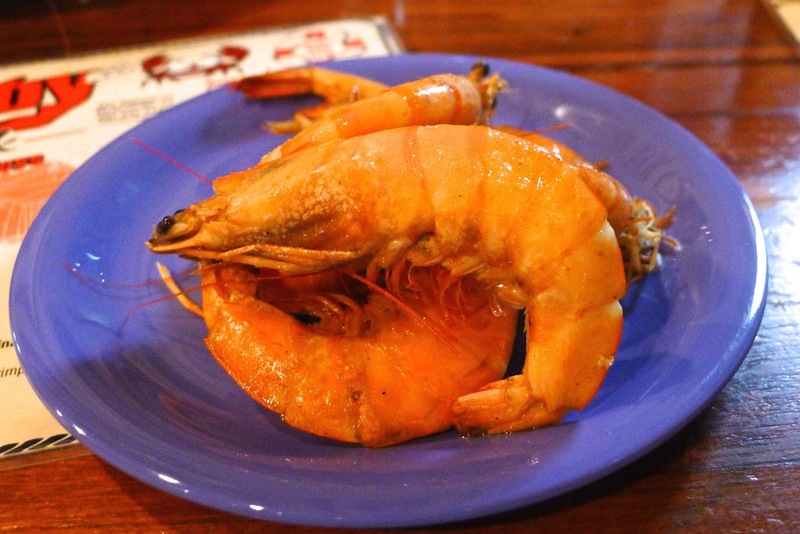 To cook shrimp, crawfish or crab, bring a pot of water to a boil with salt, lemon quarters and the mixed spices. Boil shrimp 1 minute and allow to remain in the water for 15 minutes. Drain before serving. 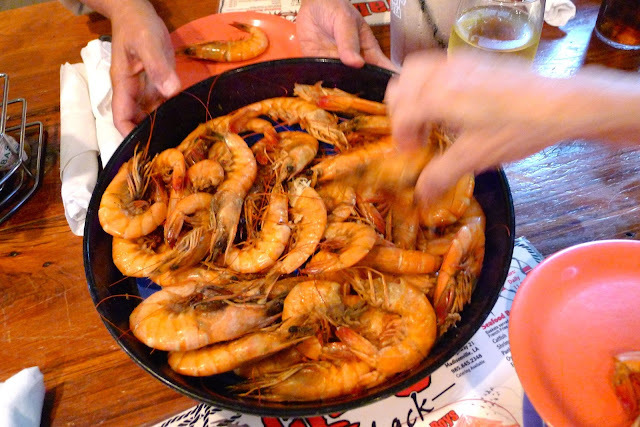 Some other dishes from dinner at Crabby Shack. Blackened catfish with a side of beans. 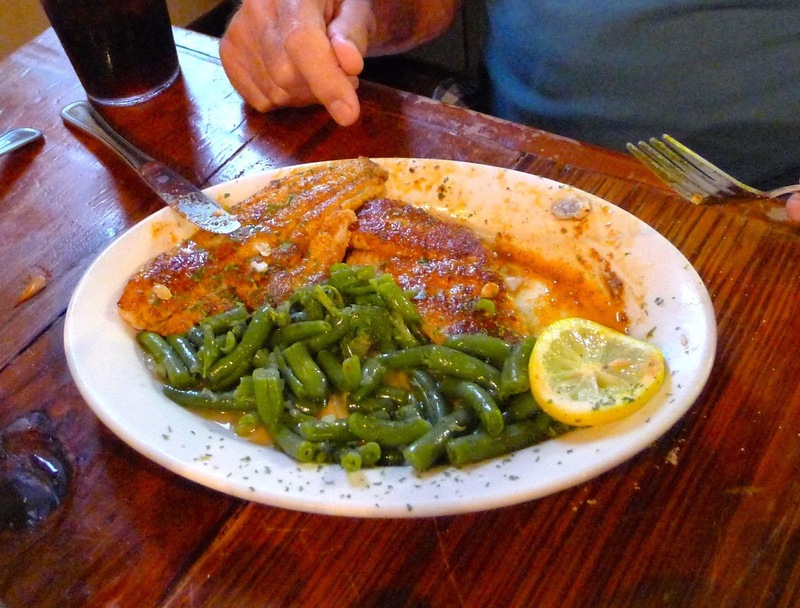 Blackened fish, a Cajun recipe, was popularized by Chef Paul Prudhomme. Fish fillets are dipped in melted butter, then coated with a spice mixture of paprika, onion and garlic powder, cayenne, ground pepper, thyme and oregano and salt and cooked in a cast-iron skillet heated white-hot. 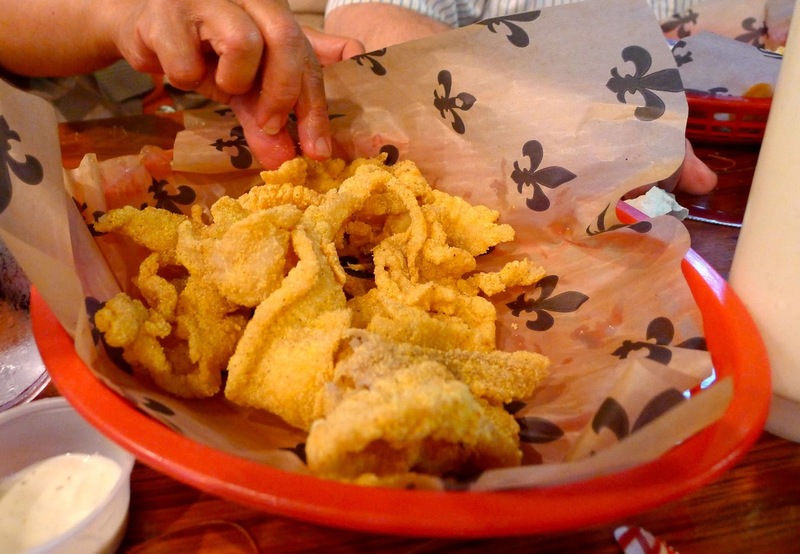 Strips of catfish fillets fried with a crunchy coating. Pass the tartar sauce! 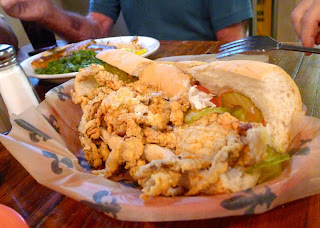 A po-boy sandwich of fried soft-shell crabs. 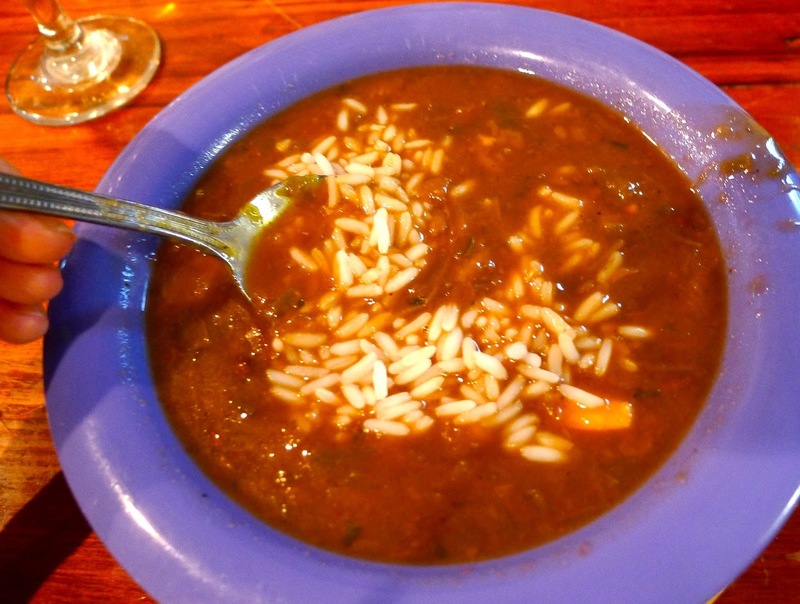 Shrimp filé gumbo, a thick soup, served with rice. Filé powder is an unusual seasoning, made from the dried and ground leaves of the North American sassafras tree. The gumbo also contains a big dose of cayenne. 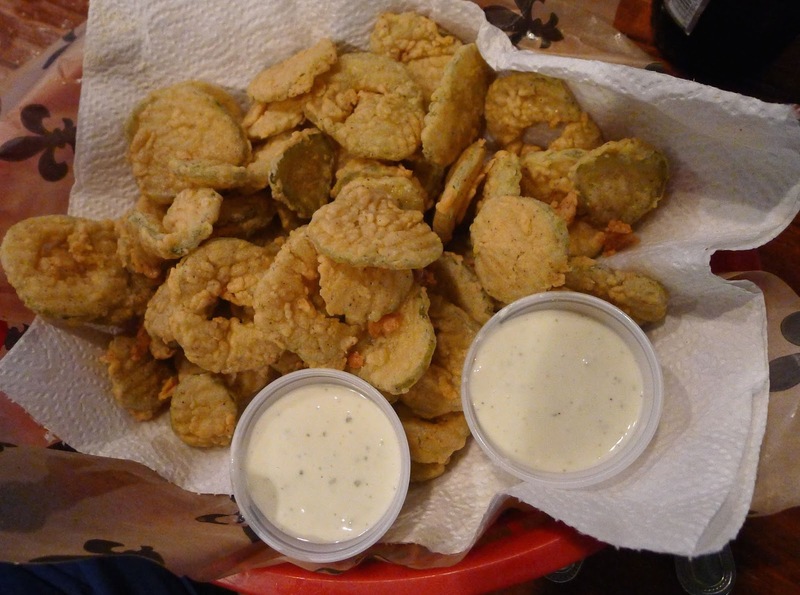 Fried pickles. Yep, slices of dill pickle, coated in batter and deep fried. In the Crabby Shack kitchen, putting together a Po-Boy. 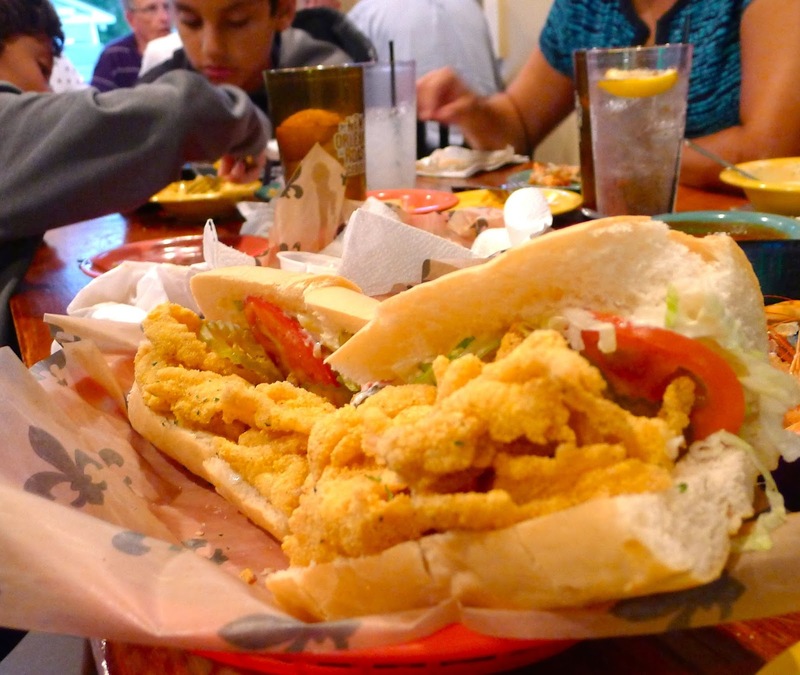 Po-boy with catfish. "Dressed?" the waiter asks. It comes with lettuce, tomato and mayo. We're going back to Crabby Shack in a few days. Shall I try the frogs legs? Then, back to my kitchen in Spain! I'll be packing some Crab Boil spices so I can cook Spanish shrimp in New Orleans style. I'm a long way from MY KITCHEN IN SPAIN this week. I'm visiting family and friends in the US. 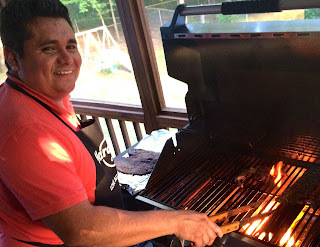 I've had some tipico Americano food--steak on the grill, corn on the cob, pizza with the grandkids. But, surprisingly perhaps for Atlanta, Georgia, most of the meals I've enjoyed had a Latin flavor. I made gazpacho and paella for 20 on the occasion of the Venezuela-Colombia game. 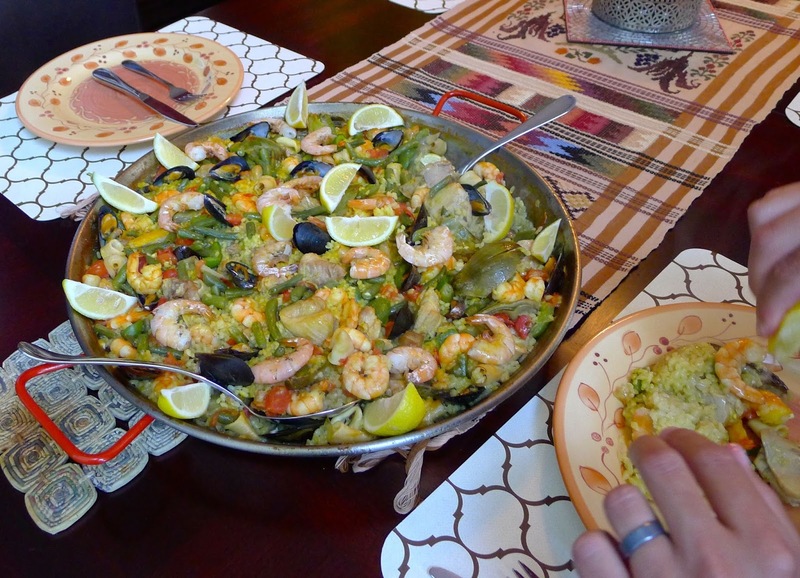 At a Hispanic market, I found good seafood and vegetables--but not the proper round-grain rice for Spanish paella. I packed the saffron and olive oil from Spain in my luggage. Watching the soccer match on TV. Colombian friends are wearing yellow. 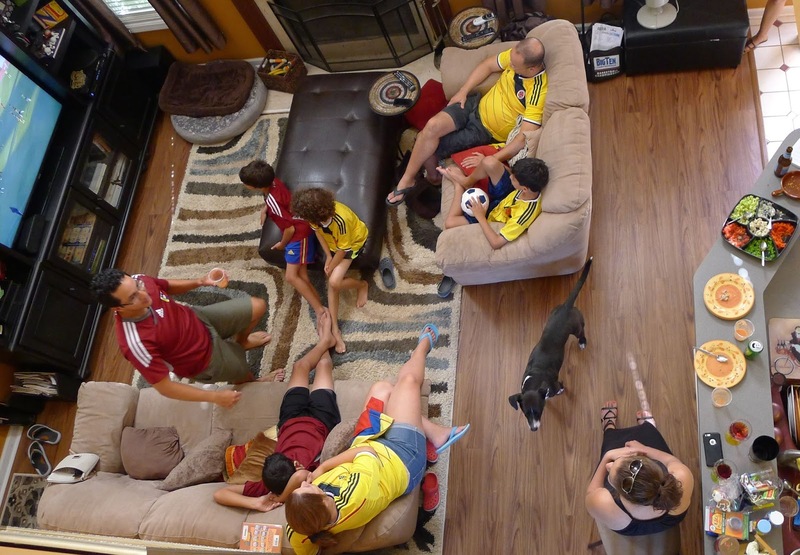 The Venezuelans, La Vino Tinto, as the team is known, the red-wine colored shirts. Much jubilation when Venezuela unexpectedly won! My Venezuelan daughter-in-law, Eli Searl, makes arepas for Sunday breakfast. 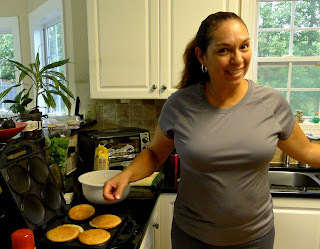 Arepas are griddle cakes made from a special corn meal. Split open, they are filled with cheese and scrambled eggs, or braised meat. 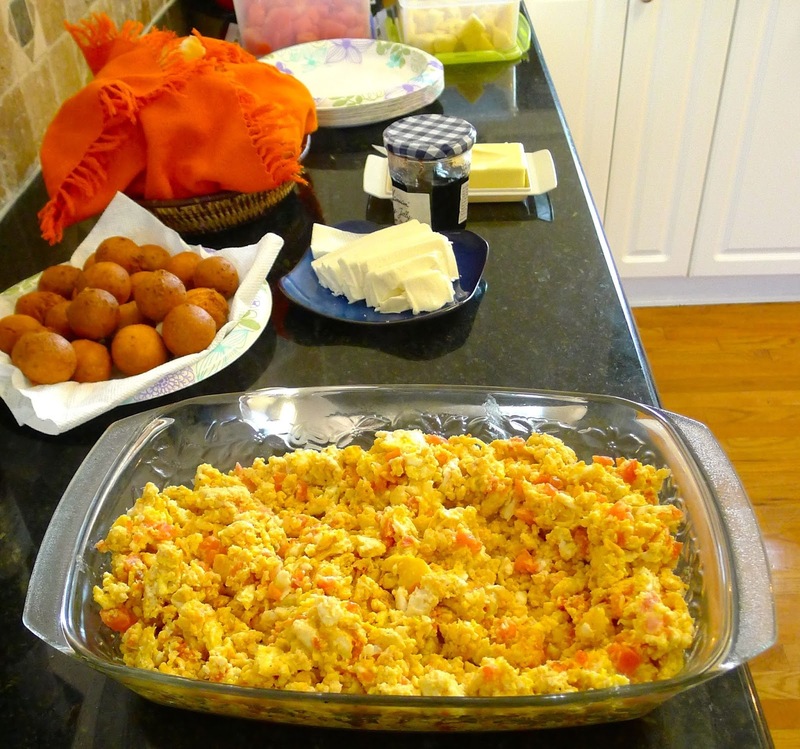 Another Latin breakfast in the home of Columbian friends. These are bunuelos (uh-oh--how do I get the tilda over the 'n' on this Americano keyboard?) 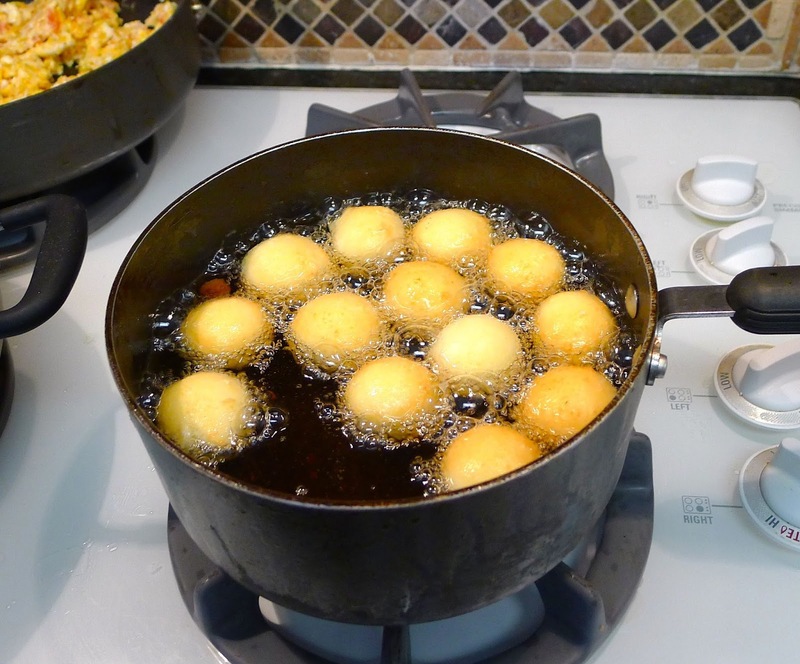 They are quite different from the bunuelos in Spain, which are made with wheat flour. These have cornstarch and cassava (yuca) flour in the batter. 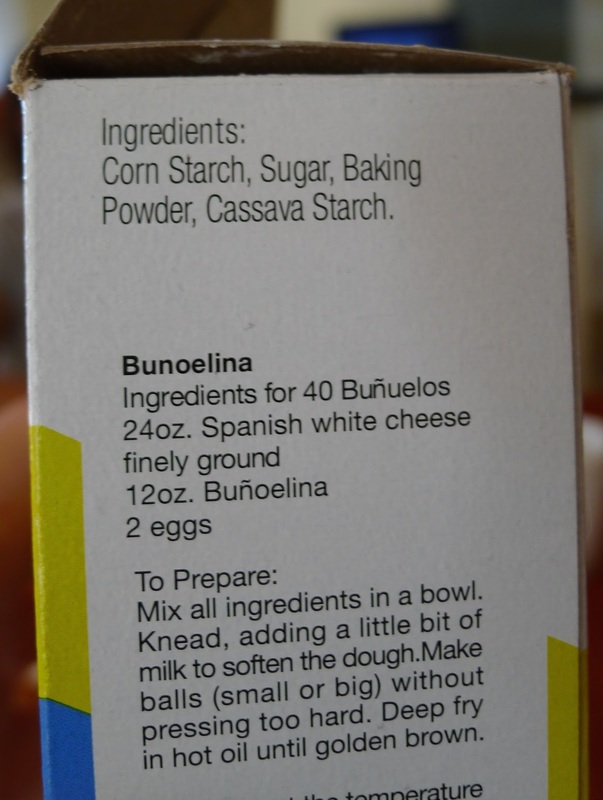 Recipe for bunuelos, using a pre-mixed flour. 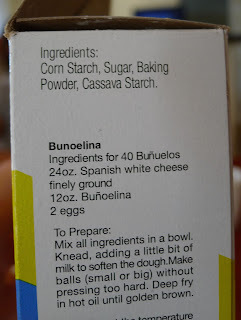 Besides bunuelos, we had huevos pericos--eggs scrambled with a sofrito of onion and tomato--plus queso fresco, fresh white cheese, bread, fruits and, of course, Colombian coffee. Plus, a bottle of Spanish cava to mix with fresh orange juice. Quite a brunch! 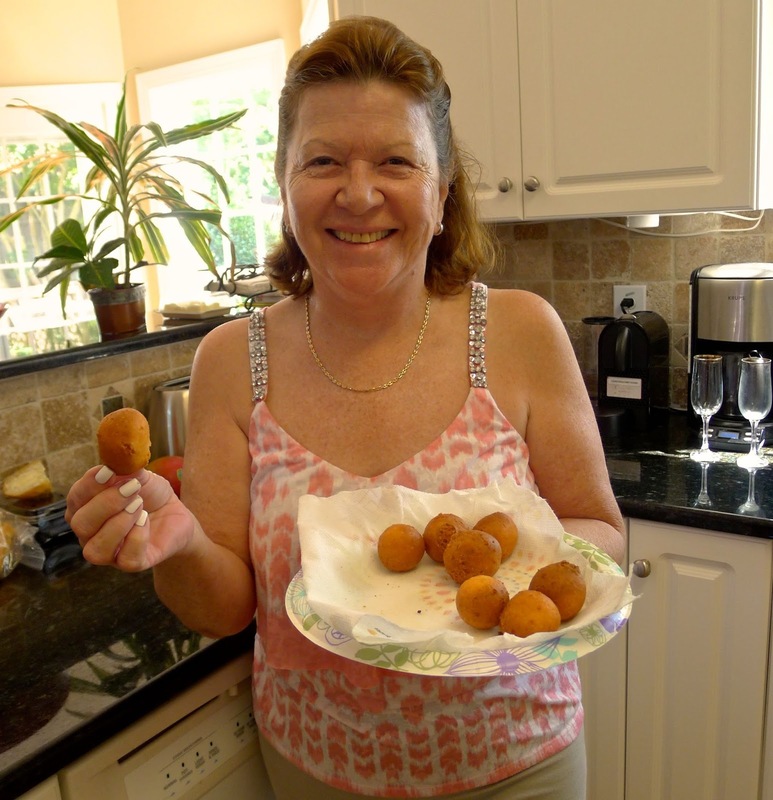 Martha Lucia Estrada from Colombia cooked the bunuelos. 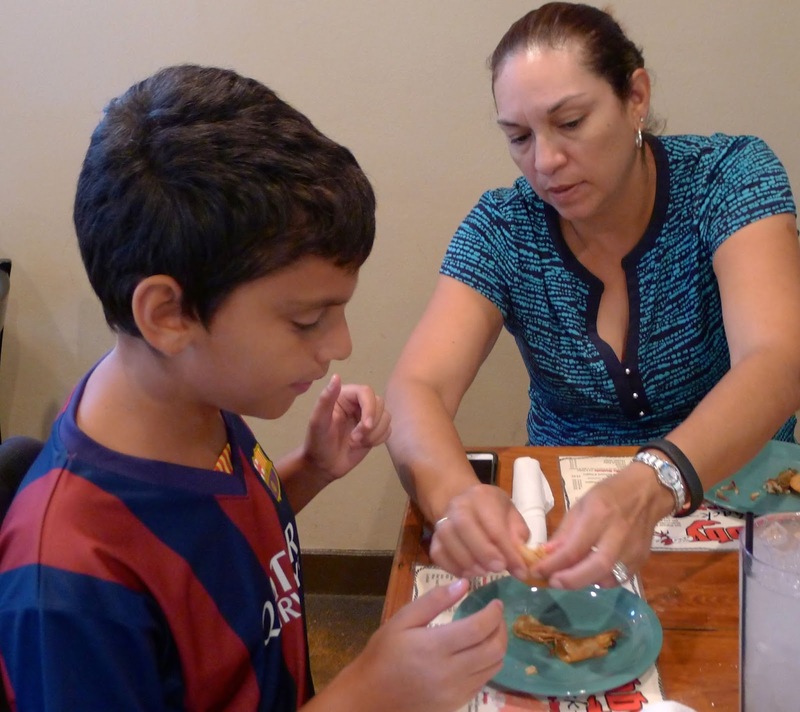 Her daughter, Milena Rodriguez made the huevos pericos. Milena's two sons, Dani and Andres, play soccer with my grandsons, Lucas and Nico. 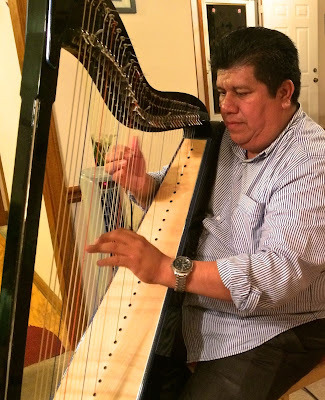 Another evening, we are invited to supper at the home of Atlanta-based Mexican artistas--dancer and musician--Lizbeth Cardenas and Antonio Rodriguez. 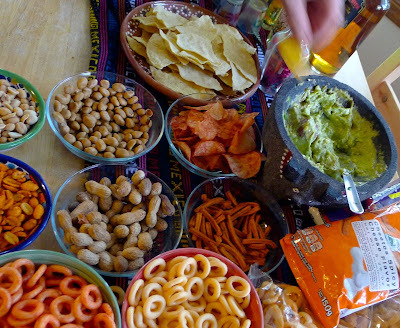 ( http://www.danceandopromotions.com/) Here, guacamole (avocado dip) with an assortment of tortilla chips, nuts, and other crunchies. 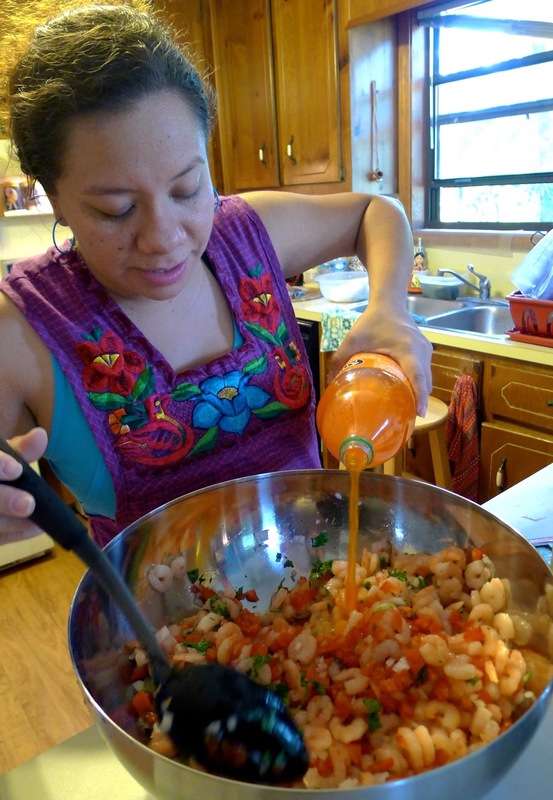 I hang out in the kitchen with Liz to learn a little about the cooking of Veracruz. Here she prepares camarones, a shrimp cocktail. The dressing has a secret ingredient--orange Fanta, which adds a citric tang, sweetness and a little fizz. 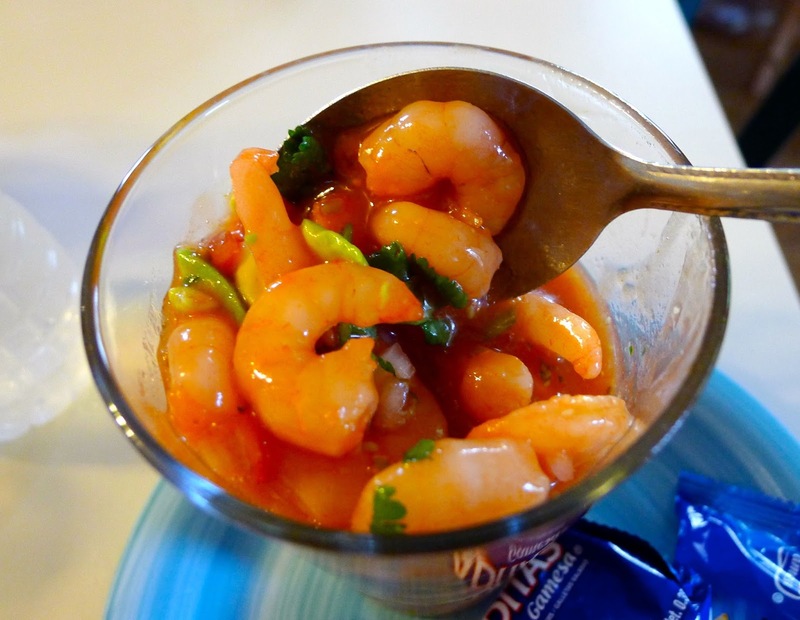 Shrimp cocktail, garnished with cilantro, is served in glass cups. Liz makes tortillas from masa harina, pressing the dough in a tortilla press, then grills them on a plancha. 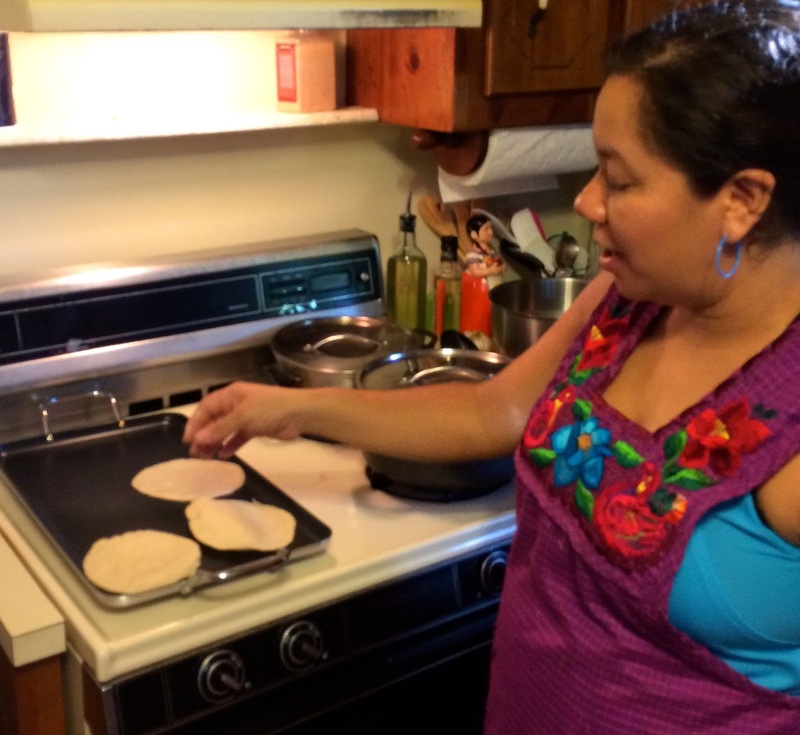 She dips the tortillas in a sauce made from tomatillos, a tangy green-husked fruit, then rolls them up with cheese. Out on the porch, Antonio grills chicken and beef strips to go with the meal. 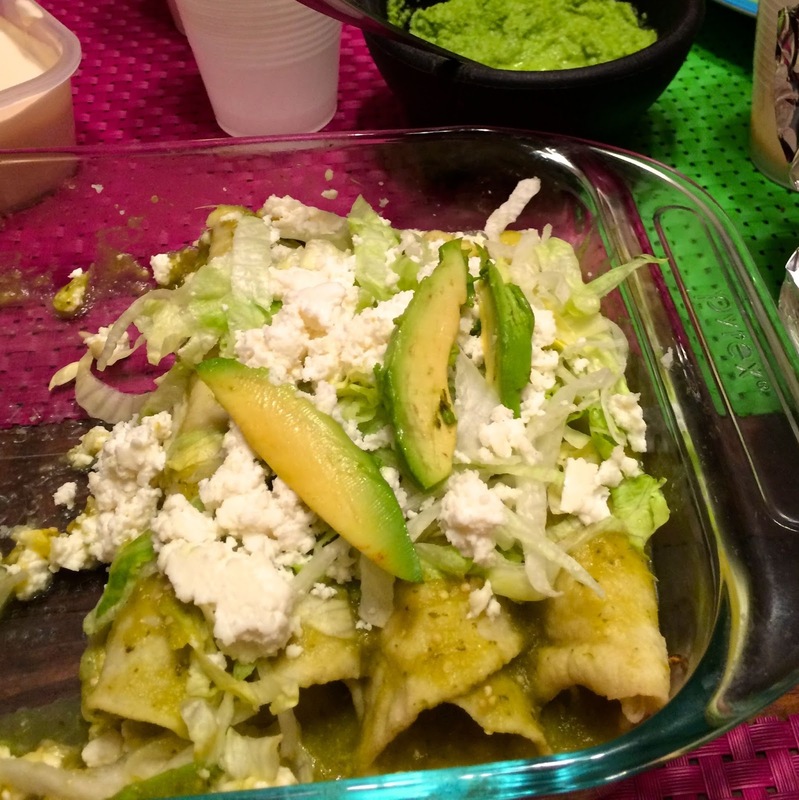 Enchiladas with tomatillo salsa, queso fresco and avocados. The evening ends with a performance by Ivan, a renowned harpist. I’m packing my bags for a visit to see my family in the US! I need to find gifts for everyone. The grandkids, 7 and 10 years old, are easy—Barça soccer shirts and shorts, maybe a bag of ChupaChups, lollipops, as well. For everybody else, I’m doing my gift shopping at the grocery store, market, and olive oil mill. Packing my bags! Food gifts for everyone. Do I dare to pack up a 2-liter jug of extra virgin olive oil? The oil comes from a small, local mill and, in theory, contains molecules of oil from my own land, because that’s where I took my olives for pressing. 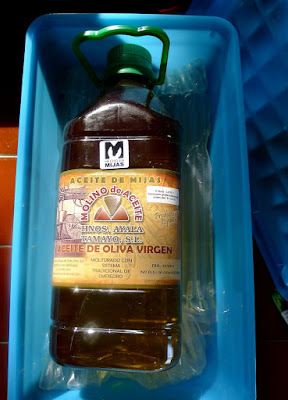 Olive oil, OK. Ibérico ham--absolutely forbidden! My son Daniel, who lives in Atlanta, orders his Spanish ham from www.tienda.com, so I’m taking him a proper ham-slicing knife. Not in the carry-on bag, of course. 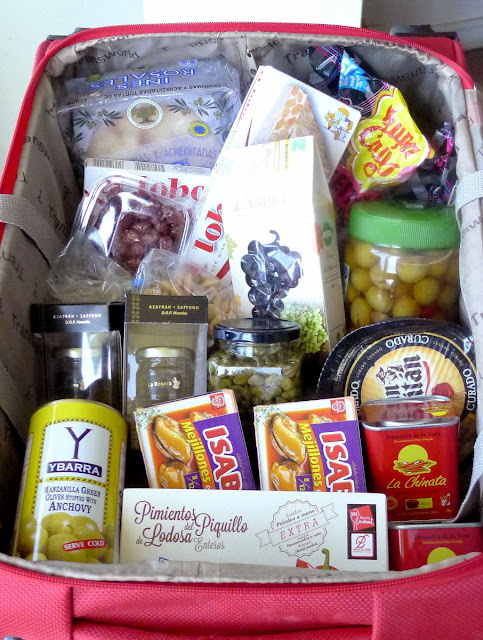 Here are some more ideas for gastronomic souvenirs from Spain. Saffron and other spices and herbs. 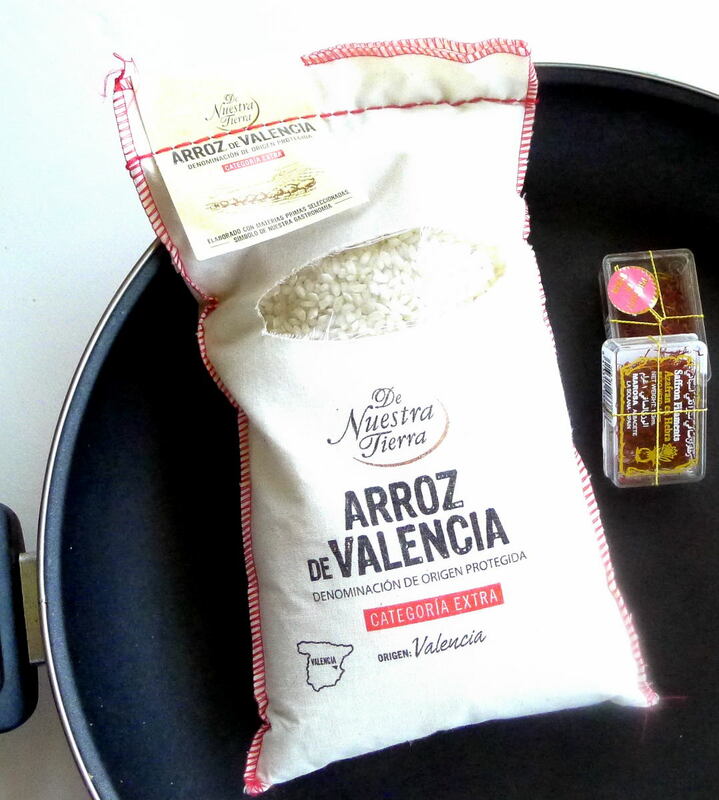 Almost as precious as gold, saffron (azafrán) will please your gourmet friends and make your own paella authentic. 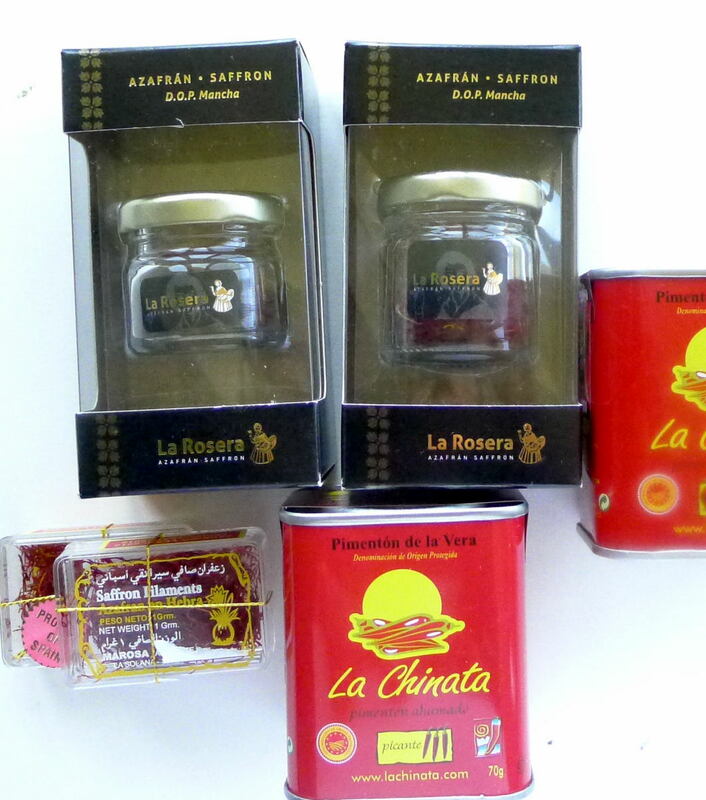 Saffron with the La Mancha DO (designation of origin) is especially esteemed, but it’s not to be found in ordinary supermarkets (look for it at El Corte Inglés supermarkets and specialty shops). I also pack lesser-grade saffron for making paella in my hosts’ homes. Pimentón de la Vera, smoked pimentón (paprika) from Extremadura is another great spice to take along. In Spain it can be found in three types, dulce, sweet; agridulce, bittersweet, and picante, hot. Almonds, raisins and candied almonds from Spain. Dried fruits and nuts. Figs, raisins and almonds are some of Spain’s finest produce. Dried, pressed figs are often sold in woven baskets. They’re also used to confect pan de higos, a spicy, sweet fig roll studded with almonds, which can be found in shops around Christmas. 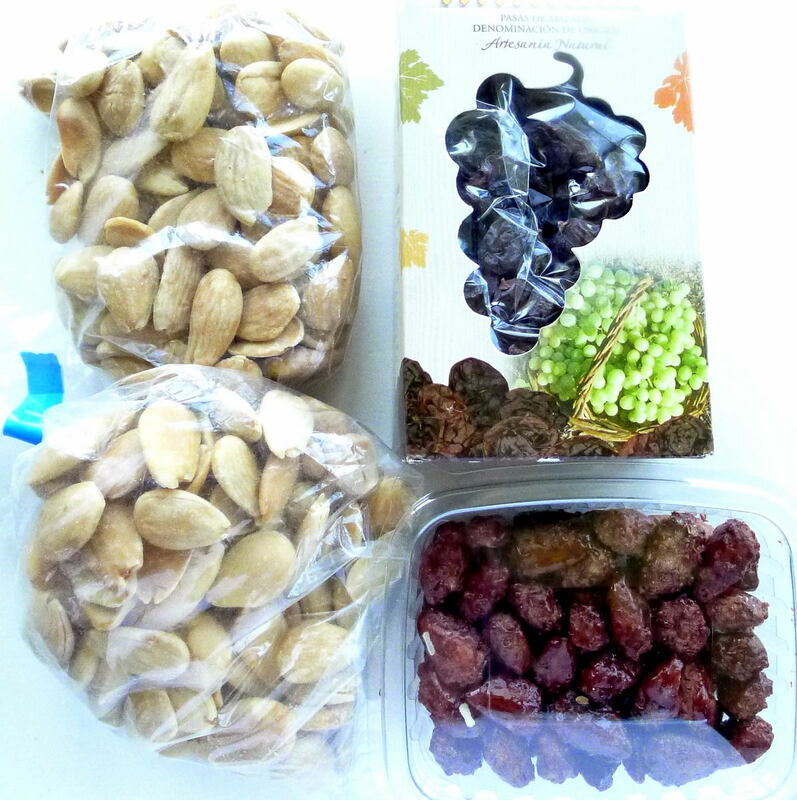 Raisins (uvas pasas) are dried muscatel grapes, the plumpest and sweetest of raisins. They come prettily packaged and are found in supermarkets everywhere. The ones pictured have D.O. Malaga. Spain is the world’s second producer of almonds (almendras). I like the ones that are lightly toasted. Purchased in markets from open stock, they are cheaper than packaged ones. Other good buys are pricey pine nuts (piñones) and hazelnuts (avellanas). Olive oil. 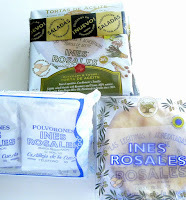 Olive oil has attained gourmet status in international cuisine and Spain is the foremost producer of this fine oil. Gift shops sell prettily packaged oils—I watched a group of Japanese tourists today mob the olive oil and saffron shelves in a village shop. Supermarkets offer a range of extra virgin oils. 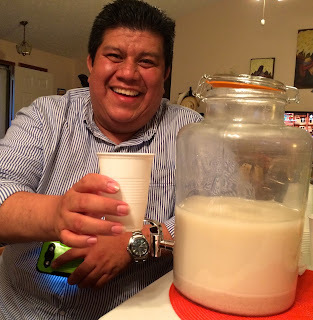 Try some of the varietal oils—Hojiblanca, Arbequina; Picual. Look for oils with D.O, denominación de origin, such as Baena, Sierra de Segura, Siurana; oil grown organically, or, the latest trend, flavored oil. 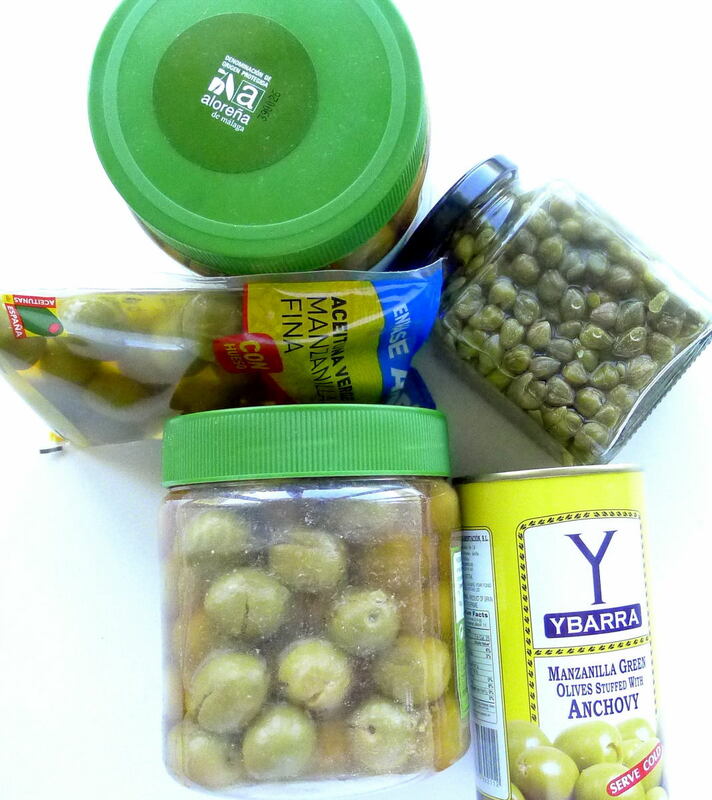 A selection of olives and capers. Olives. Spanish olives are world famous. 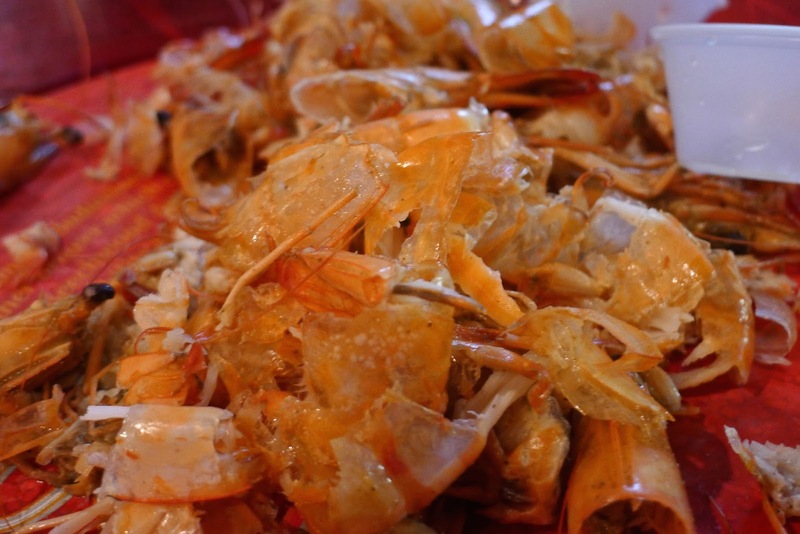 Best known are the fat, Sevilla manzanillas, which are widely exported. On their home ground, olives come in many more varieties. Try the ones stuffed with anchovies, almonds, red pepper, or home-cured ones redolent of herbs and garlic, tangy with lemon, red with pimentón (paprika) or zingy with chile pepper. They come bottled, canned or sealed in plastic envelopes. In markets you can buy olives from open stock. 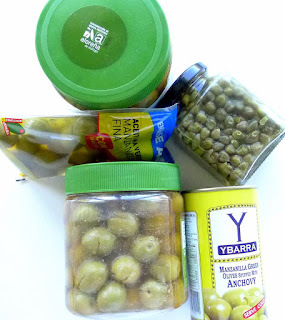 For packing in your luggage, drain off all the liquid and put the olives in plastic containers. When you get them home, put them in jars and cover with a strong brine. Refrigerate and they will keep for months. Though you’ll probably find your friends will devour them long before. Capers. Capers (alcaparras) are the pickled flower-buds of the caper bush. 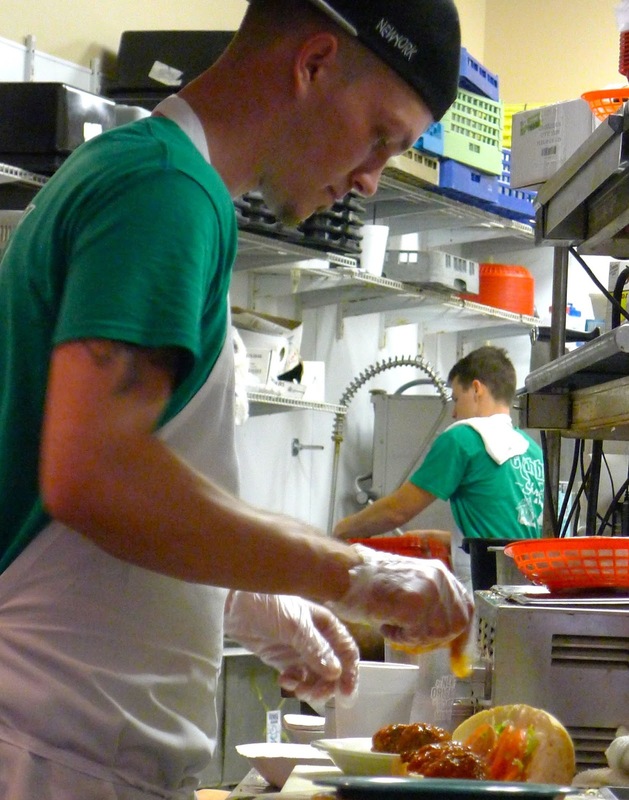 Cooks love them for their zesty flavor. 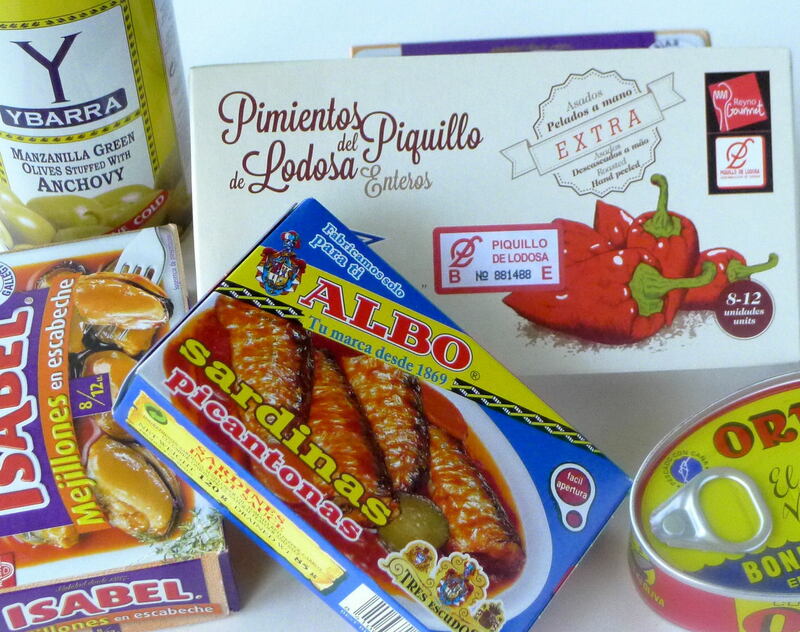 Spain is the world’s biggest producer of capers, so they are less expensive here than abroad. The tiny ones are the most appreciated. Fat caper berries, alcaparrones—the seed pods that form after the caper flowers--come with stems and can be served like olives. Canned foods. 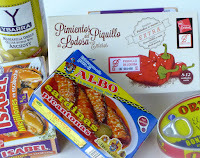 Friends abroad are always delighted to receive a little “taste of Spain.” Try them on something a little unusual, like squid in its own ink or octopus in tomato sauce, or choose pickled mussels, tuna or bonito in sauce, brined cockles, sardines in piquant sauce. I used to tuck cans of mussels in escabeche into my suitcase when visiting the US, because my mother loved them. I’ll take some along on this trip to see who is a fan. Other goodies come in cans. Piquillo peppers, those tiny whole piquant red peppers are a real treat. Conserves and preserves. It wouldn’t be proper English marmalade without the wonderfully aromatic, bitter oranges of Sevilla. 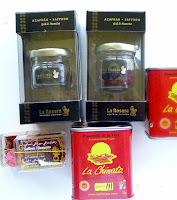 Though marmalade and other jams are by no means an exclusively Spanish product, some really good ones can be found here. Look for new flavors like onion, tomato or eggplant jam. Another gastronomic treat is dulce de membrillo, quince paste or jelly. It is sold in large tins, from which squares are cut and weighed, or in sealed, plastic packets. In a covered container, membrillo will keep for a long time. Serve quince jelly as a sweet course accompanied by a slice of white cheese and a few almonds or walnuts. 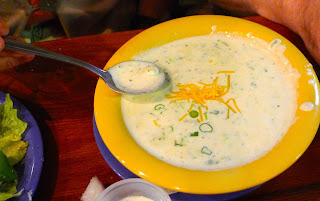 Or, puree it into garlic mayonnaise for an extraordinary sauce to serve with grilled foods. Valencia rice for paella. Not taking the pan. Rice. Medium short-grain rice, essential for paella making is not always easy to find abroad, where long-grain rice is preferred. Buy real Spanish rice, such as with denominación de origin Valencia or Calasparra. Bomba rice is one especially esteemed variety. Cheese is legal, thank god. And Spain has some fabulous cheeses that would make a welcome gift for your hosts. Manchego, a ewes’ milk cheese from central Spain, is the best known. It is marketed semi-cured and aged. Aged Manchego is splintery, with a tantalizing bite to it. Wonderful for tapas. Some other good ones: Cabrales, a blue cheese made of cows’ milk, creamy, sharper than Roquefort; Gallego, a plae yellow, mild cows’ milk cheese; Idiazabal, a smoked and cured sheep’s milk cheese, smooth and pungent; Roncal, sharp but mellow; San Simon, a cows’ milk cheese with a mild, smoky flavor. Charcuterie. If you’re traveling to the US, just skip this section, lest a sniffing beagle run you to ground. But, if traveling within Europe, consider packing a whole Spanish ham, serrano or the exceptional ibérico. Or, ask a good butcher to hand-slice ham and seal it hermetically in packets. Besides ham, Spain produces some very distinctive sausages, such as chorizo, butifarra, longaniza. Something to flavor your memories of Spain for quite a long time. Pastries and sweets. Visitors to Spain are tempted by the aroma of sugar-coated almonds, garapiñadas, confected by street vendors who proffer free samples. They are wonderfully addictive. Buy quantities of them to take back for friends. 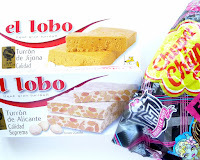 Another famous almond candy is turrón, nougat, which can be found in food shops and at open-air stalls at village fairs. 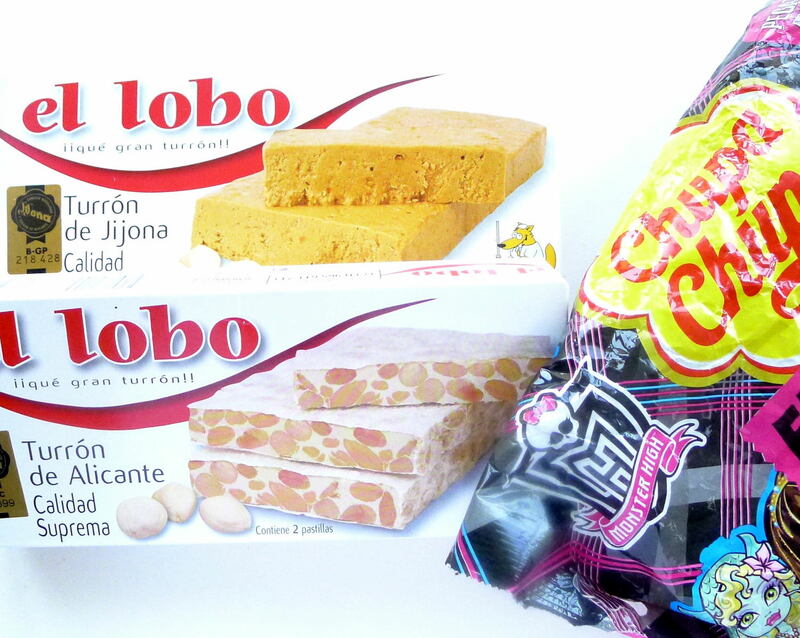 Turron, almond nougat, and lollipops. I'm taking a couple packets of authentic tortas de aceite. These are crisp, not-too-sweet cookies made with olive oil. The originals have anise and sesame seeds. But newer varieties are flavored with rosemary or almonds. Too fragile to pack in the luggage, the tortas go in my carry-on bag. Then, if I need a snack at an airport layover, I can enjoy some flavors of Spain. EAT SARDINES, SAVE THE PLANET! Some of the top chefs in the world are going to be serving up sardines, anchovies and other small fish on World Oceans Day, June 8. The list of chefs who have signed the pledge includes Joan Roca whose restaurant, El Celler de Can Roca, Girona, Spain, this week was cited as the BEST restaurant in the world. Amongst the chefs participating in Sardine Day—I mean World Oceans Day—are Massimo Bottura of Osteria Francescana, Modena, Italy, number two, and René Redzepi of Noma in Copenhagen, Denmark, in the number three spot. Sardines at a 3-star restaurant? According to the folks at Oceana, http://oceana.org, an advocacy organization dedicated to protecting the world’s oceans, the Chefs will help inspire and empower consumers to get involved in supporting Oceana’s campaigns to help restore the world’s oceans to levels of biodiversity and abundance that can survive and support the planet. This commitment is the result of a gathering of the world’s leading chefs in support of ocean conservation that took place earlier this year at the Basque Culinary Center in San Sebastian. The small fish the Chefs pledged to serve – species like anchovies, sardines, mackerel and herrings - are known as “forage” fish because they play a crucial role in some of the most productive marine ecosystems in the world. However, much forage fish is captured to make fish meal to feed farmed salmon, chickens, pigs. According to Oceana, we can feed tens of millions more people if we simply eat sardines and other forage fish directly rather than in form of farmed salmon or other animals raised on fish meal and fish oil. Eating more forage fish—along with scientific management of the world’s fisheries—will enable us to ultimately feed more people from the oceans and to be less reliant on getting our animal protein from livestock. I’m looking forward to hearing how Chef Joan Roca cooks sardines! Meanwhile, I can do my small bit! It’s a good cause and, besides, June is sardine season. 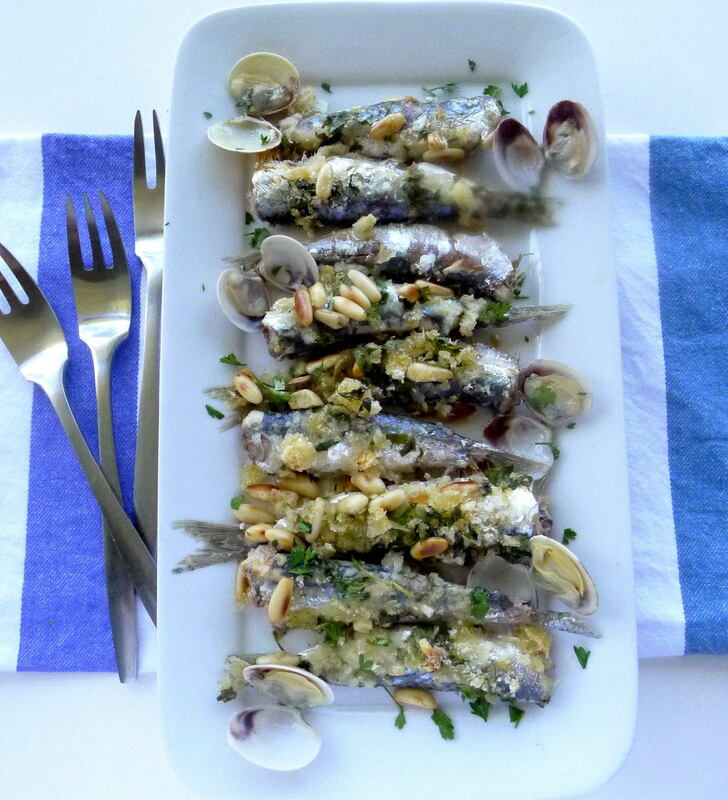 Another plus--sardines are loaded with heart-healthy Omega-3 fatty acids. My favorite way to eat fresh sardines is espetones, sardines skewed and roasted on a wood fire at the beach. Here is another tasty way with these delicious small fish. 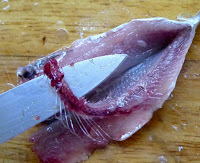 If fresh sardines are not available, use fillets of mackerel or herring. Sardines baked with pine nuts, bread crumbs and parsley. To fillet, lift out the spine. 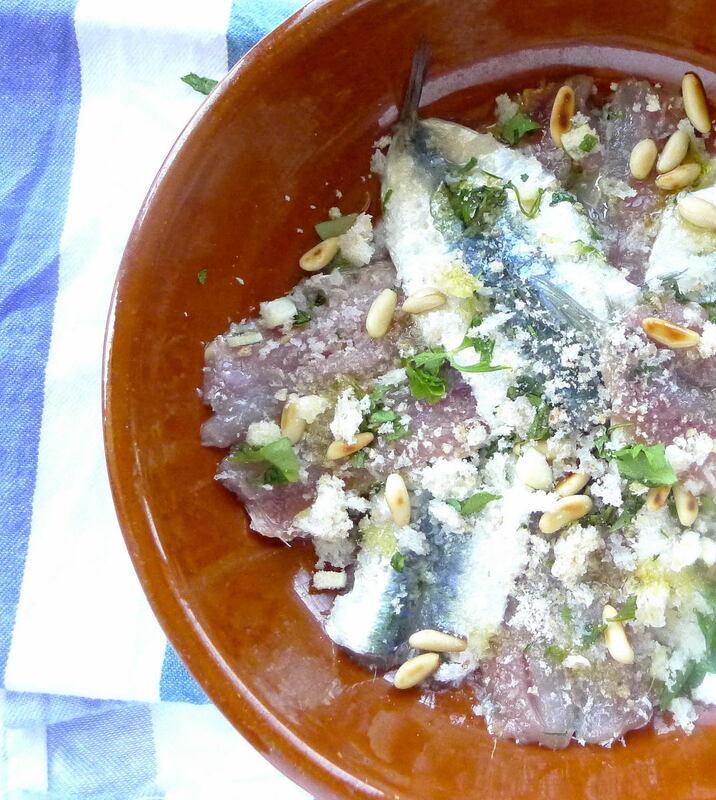 For this recipe, the sardines can be filleted or not, as you please. 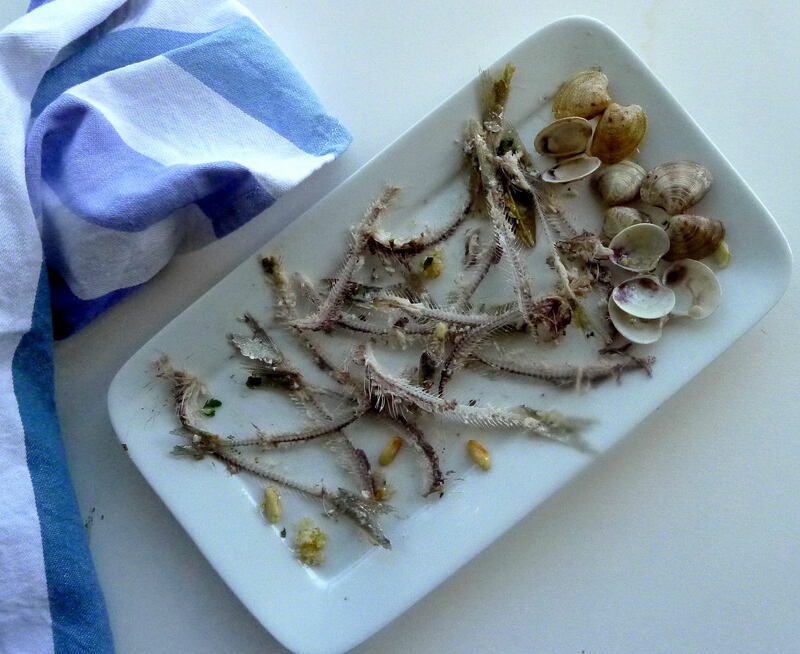 Unlike boquerones, fresh anchovies, the bones of sardines don’t easily pull away from the flesh. You have to lift the spine with knife tip or thumb, then “unzip” it by pulling between thumb and forefinger. If you decide not to fillet them, tell diners to eat them with their fingers, rather than knife and fork. Once cooked, it’s ever so easy to separate the bones. 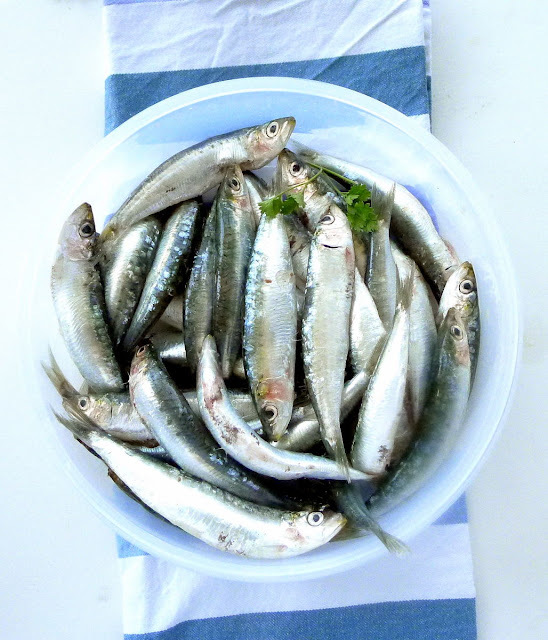 To clean the sardines, spread a thick layer of newspapers on the work surface. Slide the scales off onto the paper. Remove heads and innards. Rinse the sardines in ice water and pat dry on paper towels. Ready for the oven. These sardines are filleted. 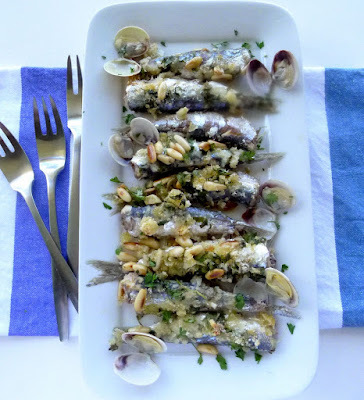 Wash the sardines and place them in a single layer in an oven pan or cazuela. Place the clams, if using, around the sardines. Break the bay leaf into pieces and tuck them in among the sardines. Sprinkle with salt. 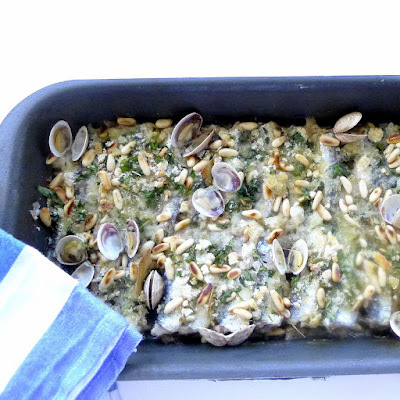 In a small bowl combine the garlic, parsley, pine nuts and bread crumbs. Spread this mixture over the sardines. Dribble the oil over them. Pour the wine into the bottom of the pan. Bake until the sardines are done, about 14 minutes. More sardine recipes here. See more about World Oceans Day here.